The first Legacies of Arnan novel, Draigon Weather, was published in 2017 to critical acclaim by both reviewers and fellow fantasy writers. A splendid debut from a talent to watch. Opens with a mature, somewhat beat up hero presented with defending a caravan under threatening circumstances. The setting and the writing and the characters are deftly realized, and the prose, sharp and straight to the point. Alternating flashback chapters slowly reveal the background, with a heroine given equal billing and plenty of ‘mind of her own’ contrary complexity. She does not exist just to put a shine on the protagonist – anything but, which is refreshing. Unlike most ‘split time’ novels, this one kept me riveted through both timelines. As the backstory converges with the present, the suspense tightens down beautifully. I found this book tough to put down, unique enough to be unforgettable, and left me raving crazy to get my hands on the sequel. For readers who love character AND plot driven books, give this quick little read a try. If you’re sick of the same old grimdark fantasy, which offers nothing new, then you’re going to love Draigon Weather, which takes the tired old dragonslayer and damsel in distress tropes and turns them on their head. It’s a well paced tale of two young people struggling against the roles they’re expected to adopt in a backward-thinking society. Refreshingly feminist, Christie’s novel is an uplifting homage to the ties of sisterhood and the power of stories. Both Leiel and Cleod are hugely sympathetic characters and their painfully parallel journeys are told through a series of short alternating chapters which span their whole childhoods. While the end of the book is satisfying, there’s still so much more to explore and many questions I want answering. I can’t wait for Book Two. This was a fantastic read! Fast-paced with many layers of insights and incredible weaving of myth and archetypes – I couldn’t put the book down. Can’t wait for the 2nd book to find out what happens next. This is a book to treasure and re-read many times. Give it to your friends and teens – both genders- it’s a really important disruption of stereotypes and human empowerment. And who doesn’t love dragons?!!! 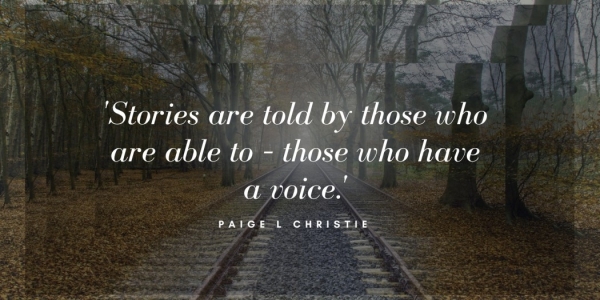 Christie uses the stories to give depth and colour to her world, but is never scared to use them to pull the wool over the reader’s eyes and mislead them. It’s the work of a virtuoso storyteller, revealing layers one at a time, always leaving hints that there’s more to come. NEWSLETTER: Unlock the First chapter in your next adventure. Sign up for my newsletter to learn about future publications, interviews and more and receive the first chapter of Draigon Weather in your inbox.